Munich. BMW honoured its best dealers from around the world at a celebratory awards evening in the BMW Group Classic. Pieter Nota, BMW AG management board member responsible for Sales and Brand BMW handed out the awards to the 41 top dealers, saying they were a thank-you from the company to its international dealer body, which had worked so hard to make 2017 yet another successful year. “2017 was the seventh year in a row where we achieved a new sales record. This consistent success is only possible with strong partners in the dealer organisation,” said Pieter Nota. “Satisfied customers are what we all strive to have. We are all working with the common goal to become even more customer-focused and service-oriented. Today’s winners are setting a great example and the Excellence in Sales Award is our thank-you to them, recognizing their achievement,” he continued. The Excellence in Sales Award is given in six different categories, plus a special Jury Award. In total, 3,100 dealers from 85 countries entered the competition. The highly-qualified jury selected the 41 winners in the categories Sales, Aftersales, Customer Service, Luxury Class and BMW i & BMW i Performance. The Manager of the Year award recognises the exceptional engagement of individual entrepreneurs. The area of sustainability was given particular importance, with the introduction this year of the “Most Sustainable Dealer” award. An overall winner was then selected in each category. 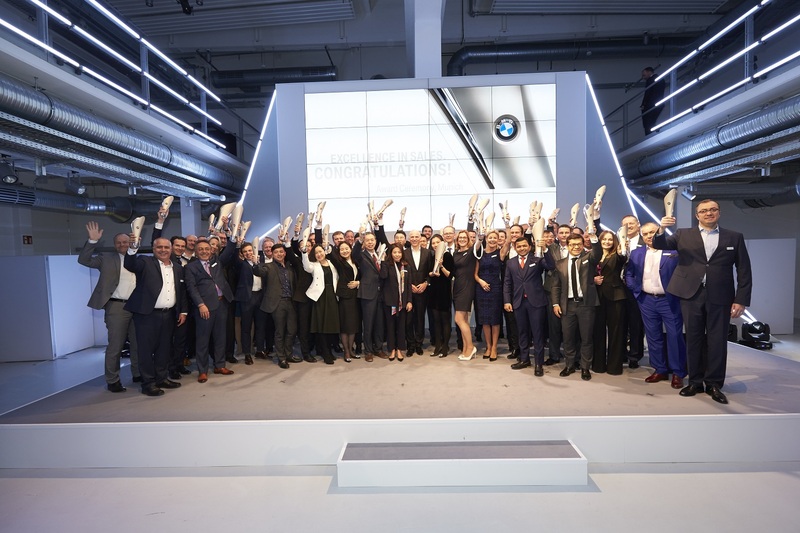 BMW invited the 41 winners to a three-day visit to Munich which included sight-seeing, fine-dining and exclusive experiences, as well as the awards ceremony. A tour of Munich in historic BMW cars offered the dealers a very special way to experience their brand’s home city. “We are currently in the biggest model offensive in our company’s history. With exciting new models like the BMW X2 and the BMW X3, together with the BMW X4 and BMW 8 Series Coupé coming later this year, I am sure that together with our partners and investors in the dealer body, we will make 2018 another record year,” said Pieter Nota in the course of the event.